U.S. Secretary of State Mike Pompeo has warned during a trip to NATO allies Slovakia and Hungary that Russia and China are trying to fill a political vacuum in central Europe caused by what he described as the United States' absence in the region over recent years. 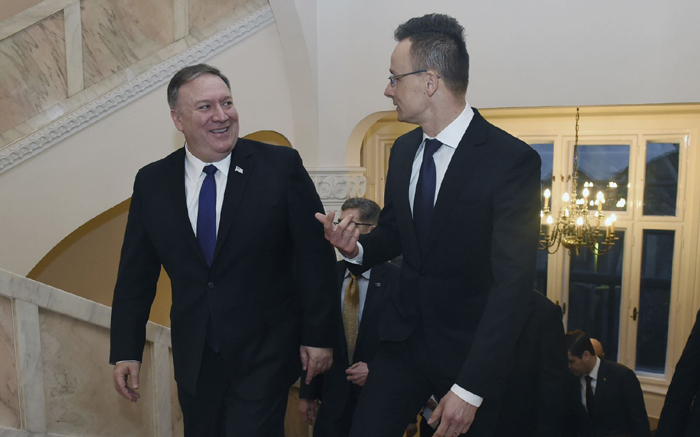 Arriving Tuesday in Bratislava, Pompeo said the United States had been a friend through three decades of post-Soviet independence. The warm sentiments echoed those given to Hungary during a visit Monday to Budapest, where he urged his Hungarian counterpart to offer more support to Kyiv following Russia's forced annexation of Crimea and invasion of eastern Ukraine. "I spoke with the foreign minister about the urgent importance of supporting Ukraine in its quest for sovereignty and territorial integrity. We must not let [Russian President Vladimir] Putin drive wedges between friends and NATO. Hungarians know all too well from their history that an authoritarian Russia will never be a friend to the freedom and sovereignty of smaller nations," said the top U.S. diplomat. Pompeo also criticized Hungary's contracts with Chinese telecom firm Huawei, which the U.S. says could be involved in Chinese state espionage. "If that equipment is co-located in places where we have important American systems, it makes it more difficult for us to partner alongside them. We want to make sure we identify them, the opportunities and the risks associated with using that equipment. And then they'll get to make their decisions," Pompeo told reporters in Budapest. A spokesperson for China's foreign ministry said Tuesday "the U.S. has spared no effort to churn out all kinds of unwarranted charges and fabricate various kinds of theories over a threat from China." "Countries that were seen by other European nations to be moving away from the political consensus, to be espousing a much more right-wing agenda on questions such as immigrants," said Eyal. The warming ties are about more than common ideology, noted Eyal. "There's two messages that the administration is putting forward. On the one hand, that these countries must pull their weight in defense questions. But at the same time, also an understanding that one size doesn't fit all, that not all European countries have to follow exactly the same position, provided they remain loyal to NATO," Eyal told VOA.